Steveston Historical Society Director Rachel Meloche will guide visitors on a walking tour full of colourful history. It was not all parasols and delicate hoop skirts in the Steveston of old. It smelled. Bad. Men who’d been long at sea came here to drink, and more. The lack of sobriety led to mayhem. Starting the first Saturday in August and running through September, the village’s colourful past comes to life every Saturday in August and September at 1 and 3 p.m. on the guided one-hour Steveston Stories walking tour. These walking tours will take residents and visitors around the village to the sites of dark deads, shady deals and immoral acts. 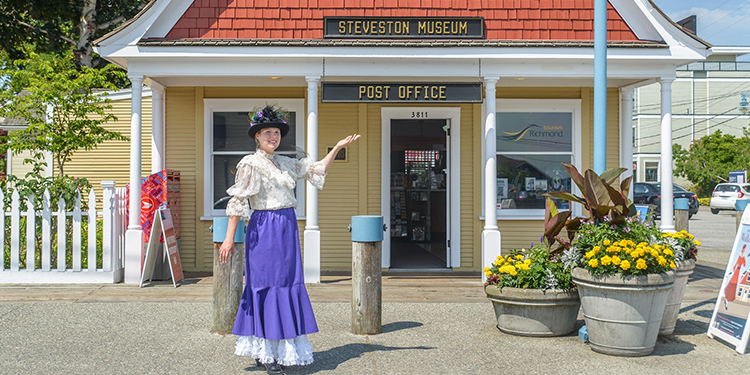 It’s a chance to discover the fascinating people, events and places that shaped Steveston. Tickets are $5 per tour. Children under 12 years old are free when accompanied by a paying adult (maximum two children per adult). Book in advance, as spaces are limited. Purchase tickets at the Tourism Richmond Visitor Centre at the Steveston Museum (3811 Moncton Street) or by calling the Visitor Centre at 604-271-8280. For more information about the tours, including tour dates, click here.